Is your kiddo ready to patrol the streets of Canada and keep safe the balance between chaos and order? He may have a big enough heart for the job but he needs the right duds. 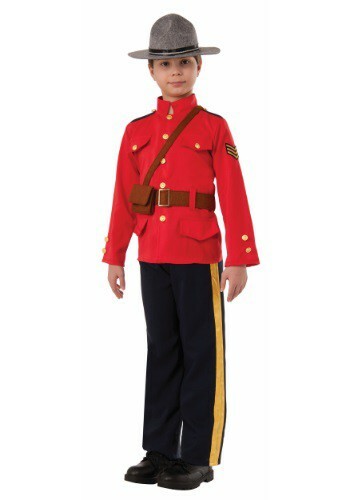 Check out this Boys Canadian Mountie Costume! It will be perfect for your little one to serve and protect the good people of Canada. If your kiddo wants to be the best Mountie he can be then he needs to look up to right guys. We are, of course, talking about the amazing Dudley Do-Right, the pristine Sergeant Preston of the Yukon, and the renowned Renfrew of the Royal Mounted! Those three really knew what it meant and what it took to be a Mountie. Once you grab your little one this costume, he’ll be more than ready to follow in the footsteps of those great men. He will be a distinct symbol of Canadian pride as recognizable as the maple leaf. Before you know it, your youngster will be on the front line defending the country he loves. Grab your kiddo a pair of boots to march around the block in as well as a fun toy rifle to carry by his side. Once his head to toe transformation is complete all he will need to do is make sure he knows the Canadian national anthem by heart and he’ll be ready to show off his nationalistic pride! Join in on the fun and take a look at our adult Mountie costumes or even our Moose costumes. This Halloween the whole family can easily show off their love for the wonderful country of Canada!